gokoosai 御更祭（ごこうさい）"changing the robes of the deity"
itadori matsuri 虎杖祭（いたどりまつり "knotweed festival"
Kifune, sometimes read Kibune (きぶね). 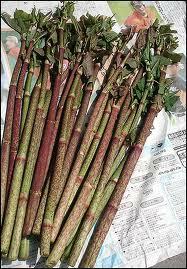 In the forests around the shrine there grow a lot of itadori, Japanese knotweed. People pick this plant and compare its length. Polygonum cuspidatum, looks like a kind of rhubarb. Formerly this festival was held on the first day of the fourth and eleventh months at Kibune Jinja in Sakyō Ward, Kyōto City, Kyōto Prefecture. At the midpoint in route between the Kibune and Upper Kamo Shrines a designated person chanted a secret song to which the other priests responded in a repetitive manner. Formerly, during the fourth month festival worshippers used to collect the Japanese knotweed that grew profusely on the mountain near the shrine in a competition for size and amount, thus leading to the popular name itadori matsuri ("Knotweed Festival"). Vestiges of this ancient festival remain in the annual shin'yo (portable shrine) processional held on June 1, and in the festivals for the changing of the kami's robes (gokōisai) held on April 1 and November 1. 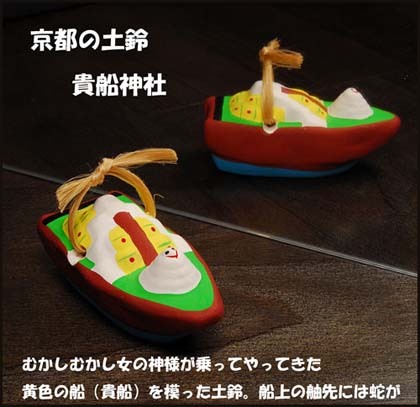 Legend tells us that the goddess Tamayori-hime appeared on a yellow boat in Osaka Bay and said, "Build a sanctuary at the place where this boat stops and deify the spirit of the locality, and the country will prosper." The boat floated up the rivers of Yodogawa to the river Kamogawa, stopping at the beginning of the stream.
. Kuraokami, Takaokami 高おかみ神 , Kuramitsuha .
. 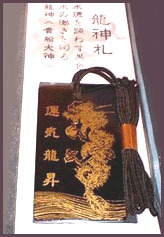 The Dragon Art Gallery - 2012 .
. Amulet for fishing from Kibune Shrine .
. Summer Purification (nagoshi, harae) .
. Enmusubi 縁結び to find a good partner . 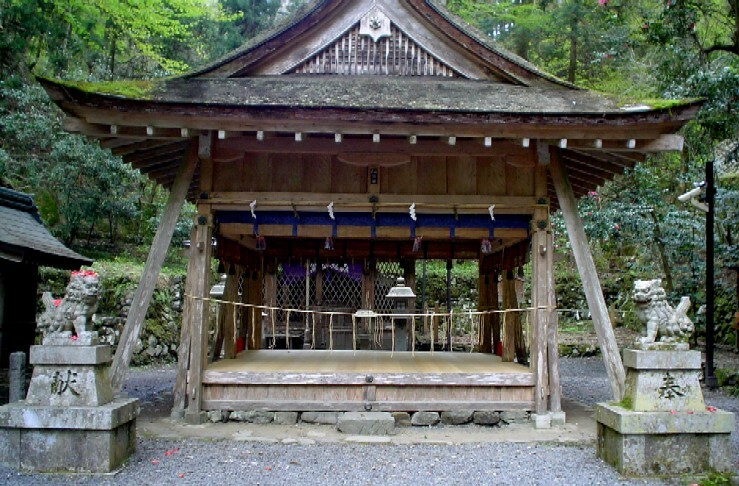 In Kyoto, Kibune Shrine deifies Takaokami-no-kami, who is worshiped as a rain god. It is described in the Shoku-nihongi, the Nihon-koki, the Shoku-nihon-koki , the Montoku-tenno Jitsuroku, and the Sandai Jitsuroku that from 765, the seventh year of Tempyohoji, people prayed almost every year to Niu-Kawakami and Kibune for rain. They are said to have offered a black horse when they wanted the rains to start and a white horse when they wanted the rains to end because it was believed that the spirit of the gods descend to earth on a horse. Black is the color for casting a rain spell as it symbolizes dark clouds bringing rain. In contrast, white is the symbol of the bright sun. These prayers were held as national events. 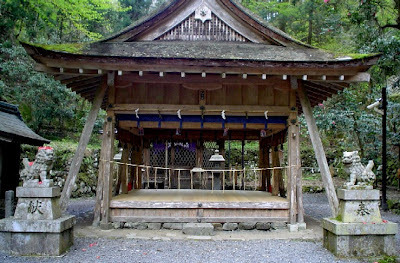 Even Murasaki Shikibu was aware of the powers of the water at Kibune Shrine. She came here to pray for the love of her husband, and her prayer was granted. Now the shrine is also worshipped by lovers, praying to the "god of good marriage". Workers also pray for a good relationship with their employers. Even special soap is sold at the shrine. This dragon hole inhabited by a white dragon, who brings prosperity to those who worship him. It is a great "power spot" of Japan. Once a carpenter lost his chisle, as it fell into the hole. But to his surprize, a strong wind blew out of the whole and his chisle fell back on the ground in front of his feet. The origin of this festival is rain-making rituals. Now is more like for showing our gratitude to water. The festival consists of offering tea ceremony, dancing and cooking ceremony in front of the Gods. Tea cremony, of course, cannot be done without water, so it's the symbolic ceremony of this festival. And the cooking ceremony is offered by the special cooking school called Ikuma school. Ancestors of the Ikuma school used to be cookers for the Imperial family. It is said that the current master is 29th-generation of the family. Horses offered to the gods in rain rituals. 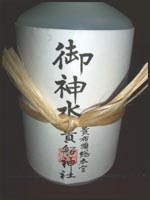 Ashigara-shimo-gun, Kanagawa pref. 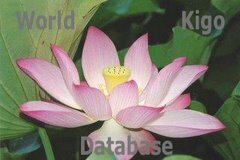 is counted as one of Japan’s three largest marine festivals and a designated National Significant Intangible Folk Cultural Asset. 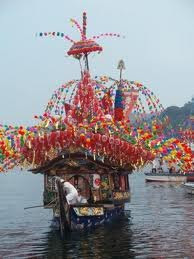 The origin of the festival is dated back to the middle of the 17th century, when people began to put Mikoshi (portable shrine) on a ship to pray for purification of fishing boats and stone carrying boats in the harbor and then carried it around the village. This old, traditional and pious festival is held on July 27th to 28th, filling the whole town of Manazuru with air of excitement. As the festival is composed of a lot of exciting spectacles such as the colorfully carved Kobaya-bune boat, Manazuru-bayashi (traditional band playing music) lively cheering up the town, reverent Kashima-odori dance, and flower floats and Kaidenma (the towing boat) for which masculine strength is fully expressed, a lot of tourists from all over the country visit the town of Manazuru. On these two days, the citizens of Manazuru all pull together to make this festival a great success. In Kyoto, near shrine Kibune Jinja 貴船神社 served in the forest restaurants along the clean river. sessha 摂社 "auxiliary shrine" - - - massha 末社 "branch shrine"
as it appeared in 1780, from the Miyako Meisho Zue 都名所図会, vol. 6 巻之六 後玄武再刻, p. 19 19頁. 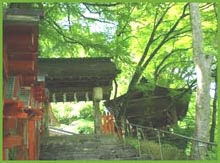 ,,, the reading of the shrine's name -- Kibune Jinja. This reading is also confirmed on pp. 253-254 of 京都大辞典 Kyoto Daijiten Dictionary, ed., Sawa Ryuken et al. 佐和隆研 等 (Kyoto: 1984 京都 淡交社 昭和五十九年). Hashihime, Hashi Hime 橋姫 / はし姫 "Princess of the Bridge"